The short answer is yes, but it depends on your skill level and amount of free time. While some homeowners are able to replace bathroom vanities without drama, many need the expertise of a remodeling contractor to avoid issues with plumbing, electrical, flooring, and walls. For example, a common mistake we see from DIY homeowners is not getting the right height vanity for their bathroom plumbing. If your bathroom was exactly like the one in an online tutorial, you’d probably be fine installing bathroom vanities on your own. However, the truth is that each bathroom (along with its plumbing) is unique. For example, you may need to consider the fact that your flooring doesn’t continue underneath your current vanity. You may also discover that plumbing shutoff valves were never installed. If you run into complications, you’ll need to hire a bathroom remodeling contractor to make sure your project runs smoothly. It’s much easier to hire a professional before your bathroom remodel than to hire one after you’ve ripped up the floor and ruined your bathroom. Don’t let your pride get in the way of a functioning bathroom. Not everything is a DIY job, especially if this is your first bathroom remodel. It’s important to recognize whether you have the skills for bathroom plumbing, electrical, flooring, and cabinetry. Do you have the creativity to know how to fix a backsplash tile after replacing the bathroom vanity with sink? If you’re changing the location of your sink, do you have experience with plumbing? These types of questions will let you know whether you’re capable of doing bathroom renovations without a contractor. How much time do you have to replace bathroom vanities? If you’re working under a deadline to get the bathroom remodel done, you may be better off hiring a contractor. Our bathroom remodeling contractors work efficiently and produce quality results. 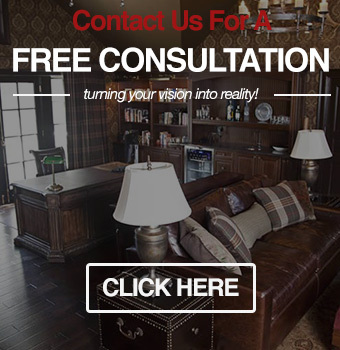 Whether you only have one bathroom in your home or need to get the remodel done before your elderly parent moves in from the nursing home, you can count on our expertise. We understand that our customers lead busy lives, which is why we’re respectful of your timelines. If you don’t have the experience to do bathroom renovations, you’ll save money in the long run by hiring a contractor. The last thing you want is to make a mistake that ends up costing you hundreds (or even thousands) of dollars in repairs. For example, a mistake with bathroom plumbing could cause water damage inside your walls. If you aren’t sure if you have the skills for a bathroom remodel, it’s important to respect your limits by calling a professional. 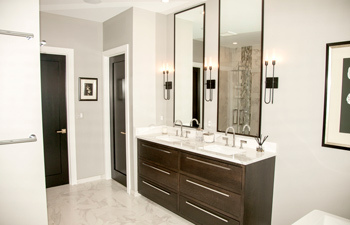 Our bathroom contractors in Oakland County have the training and experience to install bathroom vanities. To request a quote for your next bathroom remodel, call Visionary Cabinetry & Design at (248) 850-7178.